For regulation geeks and insomniacs only. Interestingly(? ), of the 72 sets of NJDEP rules, only 4 include a mention of forest management: Freshwater Wetlands (7:7A), Flood Hazard (7:13), Highlands (7:38) and Pinelands (7:50). 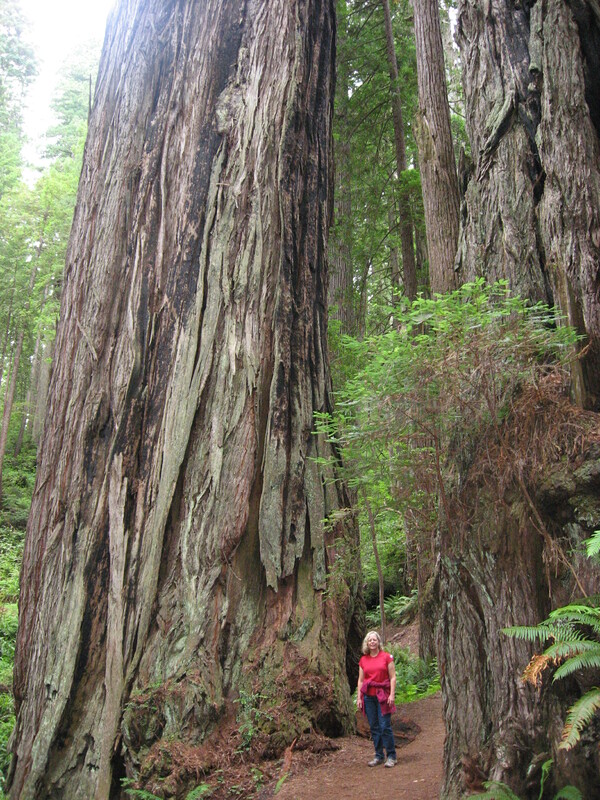 Curiously, the Forestry rules (7:3) have nothing to do with forest management. The current, recommended tactic for oak regeneration? #1. Outplanting of larger seedlings that you've grown in your own home nursery. #2. Outplanting each year of smaller numbers (10-15?) 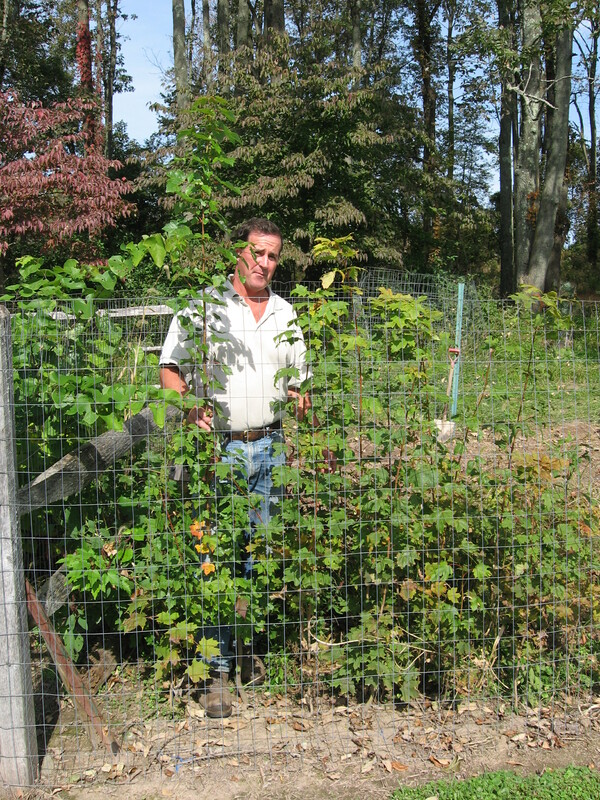 of large-size seedlings in mid-October. #3. 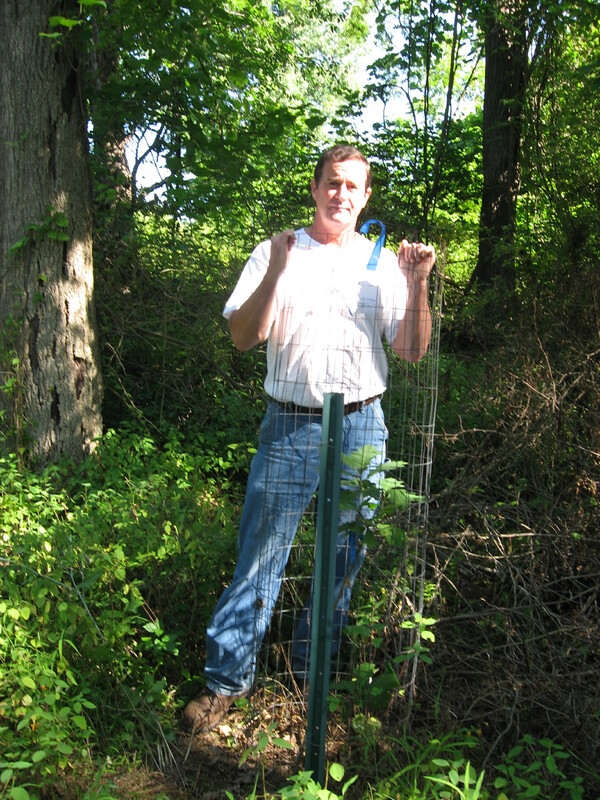 Protect each outplanted seedling with a sturdy, durable cage until tree has grown above deer-browse height (5'+). This 16'x20' fenced area had enough room for 50 of this year's sugar maples (foreground, left), 75 oaks, 75 Norway spruce, 30 persimmon (not visible), and a few left-over Scotch pines. 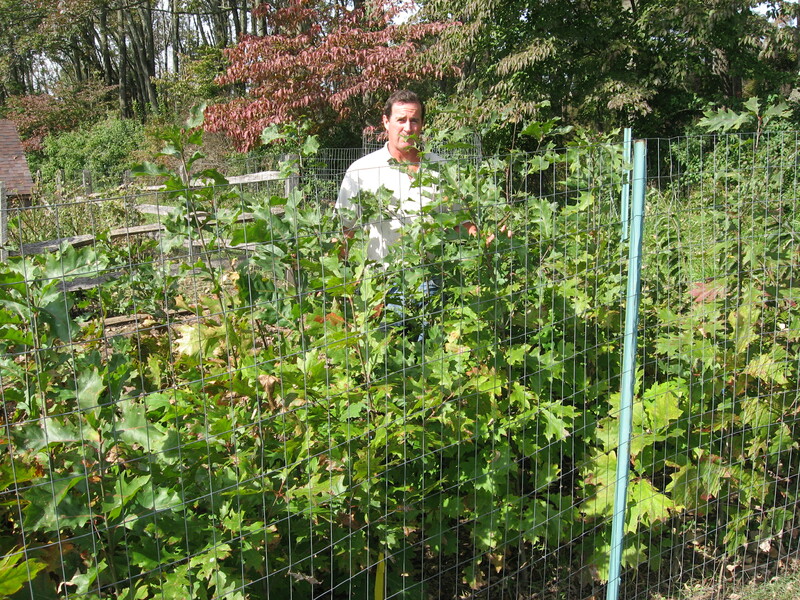 A 4' length of that 5'-high, 2"x4", welded-wire fence is used to create a 16"-diameter cage (held up with one of those 5' green "T" stakes) needed to protect a large-size seedling once it's outplanted into the woodlot. #1. Nursery care should include watering during dry summers, and regular weed control. #2. Applications of fertilizer every 3 weeks from mid-May to mid-July will increase growth (ex. - 1 tbsp/gal. of Miracle-Gro). #3. During outplanting, soil on roots is a plus, but bare-rooted seedlings are okay if transferred quickly from nursery to woodlot during dormant period (after Oct.15). #4. Tree-protection cages are not cheap - about $5 per. A theoretical outplanting of 15 trees each Oct. 15th for three years will therefore require an investment of $225 for 45 cages. It is presumed that in year #4 the cages from year #1 trees can be removed and used for year #4 seedlings, extending the life of that investment, and so on and so forth. #5. Tall, skinny trees now unprotected after cages have been removed will be vulnerable to antler rubbing. A small tube of relatively-cheap chicken wire can be installed, or this would be the time to get some use out of all of those old mesh tubes (fastened with twist ties). 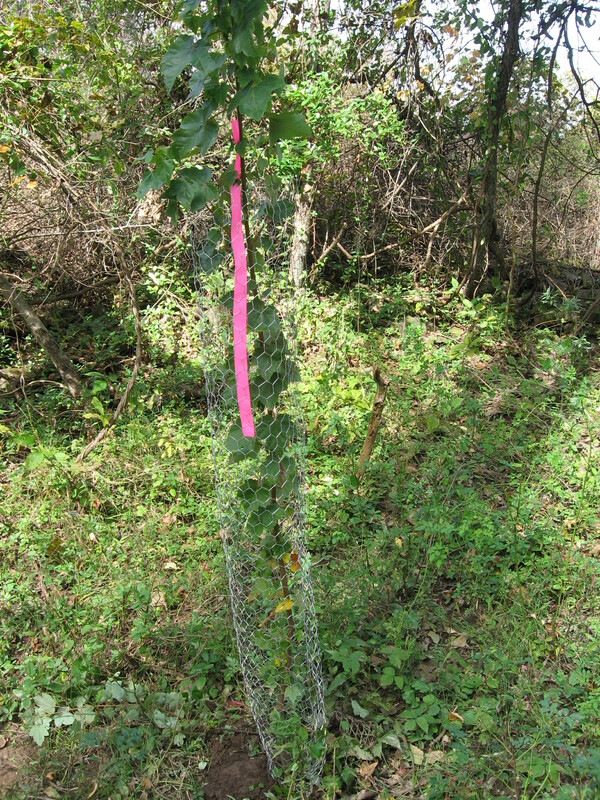 A 5' cage of welded wire held up with a T stake is protecting a seedling that was outplanted in October, 2010. Growth in 2011 has only been about 8" in this lightly-shaded, woodand setting. Will see what a goose with some fertilizer will do by summer's end. 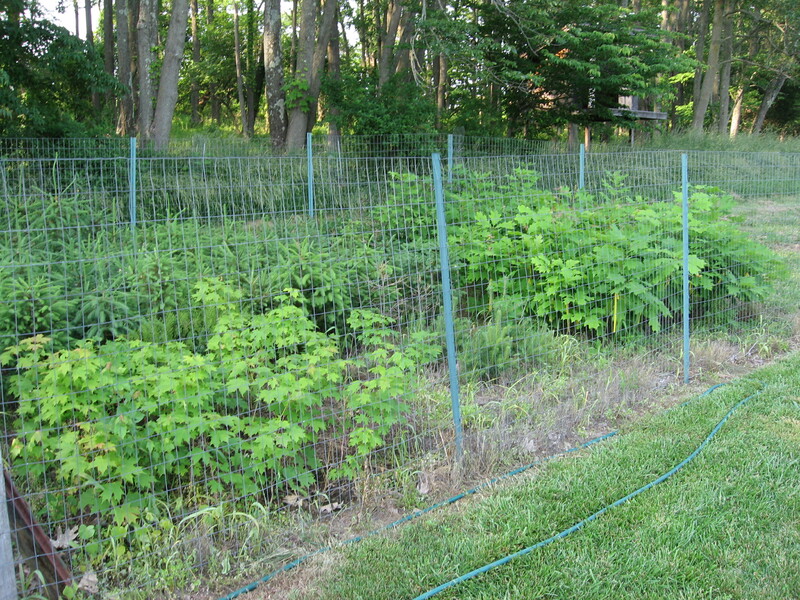 Note that vegetation around the cage is being controlled with Roundup. A reminder that a 2% solution (2.5 oz./gal.) of glyphosate (the active ingredient in Roundup) will result in complete (and safe) control of multiflora rose and pretty much all other invasive, non-native species. Generic formulations of the herbicide (look on the label for 41% glyphosate) is available as cheaply as $50 for a 2.5-gallon jug. Of course, application of any pesticide should only be performed as per labeled instructions. Of the 50 sugar maples planted into the nursery bed in April, 2011, 10 are 4.5'-5' tall by the end of the summer. A red maple that snuck into the seedling packet (held in my right hand) grew to 7' in one season. At the end of second summer, many of the red oak seedlings planted in April, 2010 are 5'+. 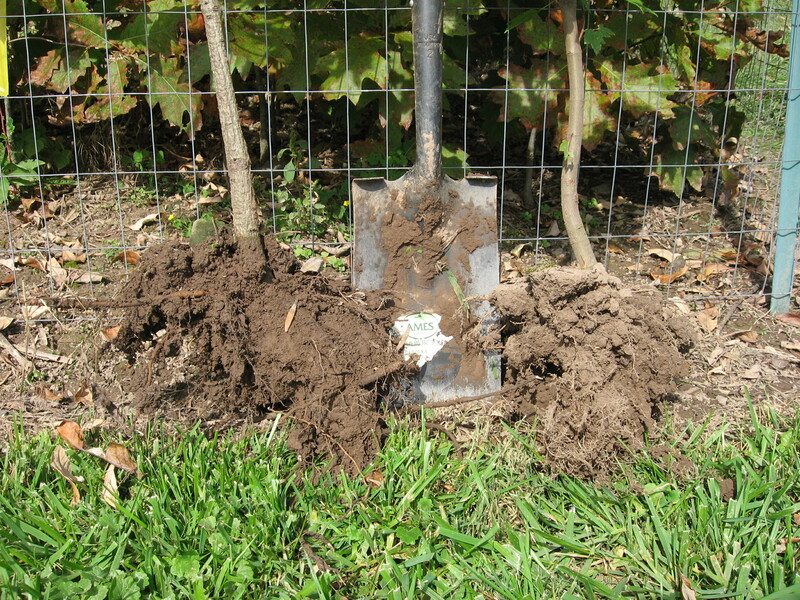 The hardest part of digging is removing a tree from a crowded nursery bed while leaving its neighbors intact. An attempt was made to fully cut away the roots (instead of tearing them out), and to retain as much soil as possible, but the key is to get the trees back into the ground a.s.a.p. Will these trees live? We'll find out in about 8 months. The 7' red maple seedling is tall enough to not need a 5' cage to protect it from browsing, but it still gets a tube of chicken wire to protect it from antler rubbing.